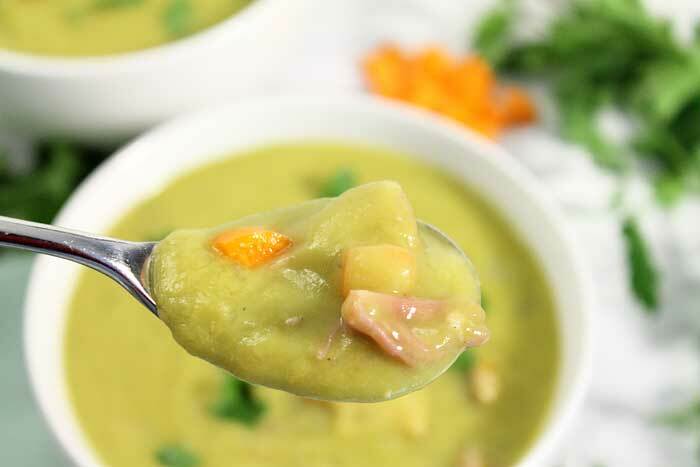 This Instant Pot Split Pea Soup is a rich, warming soup that can be on the dinner table in 30 minutes! 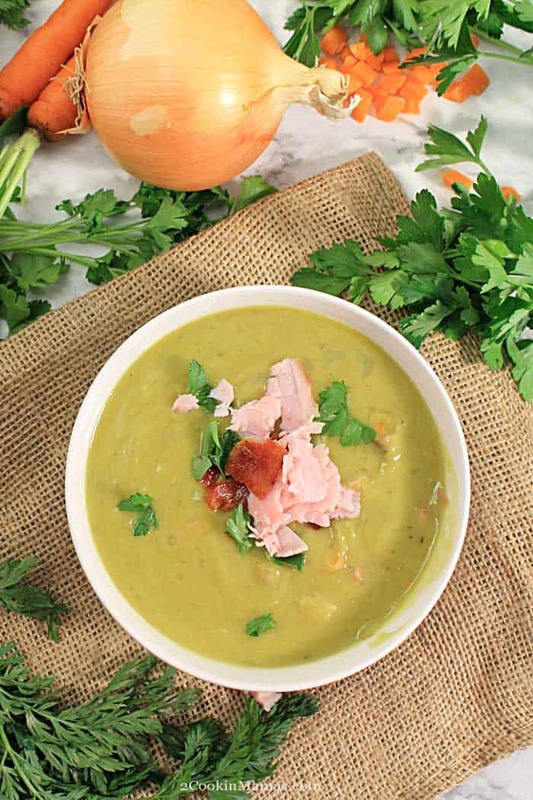 It has a rich split pea base with a wonderful smoked ham flavor running through it. The additional ham, carrots and celery bring a bit more vitamins and minerals to the mix for a healthy, hearty, meal in a bowl. The perfect comfort food for keeping warm this winter. I have to admit that I got my Instant Pot about 4 months ago and hadn’t really experimented much with it. I used to cook all the time with a pressure cooker when I was younger so I thought this would be an easy peasy appliance to just pick up and use. 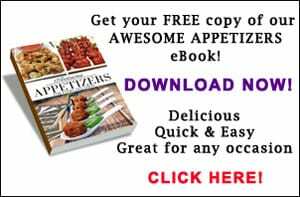 And, once I started using it in earnest, I could definitely see why this is a favorite for everyone needing to get a delicious dinner on the table quickly. 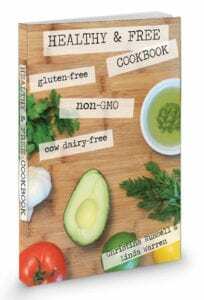 I’m a definite convert to all things Instant Pot! 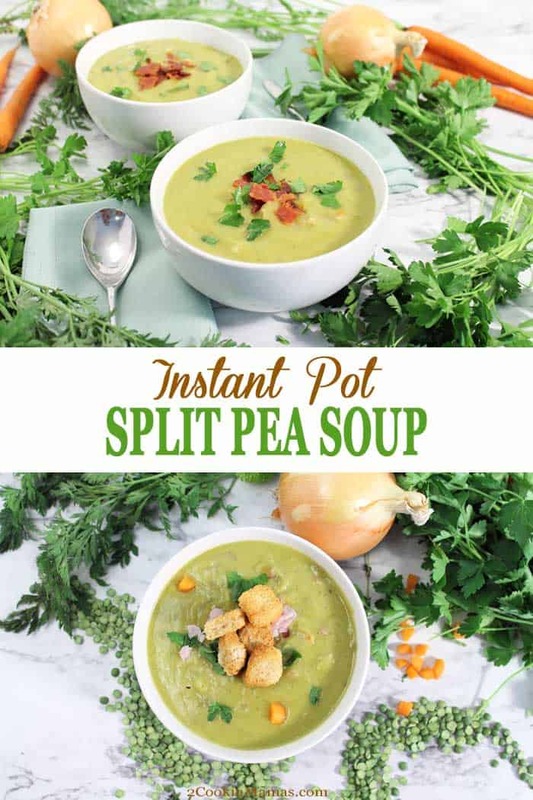 This Instant Pot Split Pea Soup is the second recipe I’ve made with this incredible appliance, the first being a Sweet Potato Butternut Squash Soup this past fall. 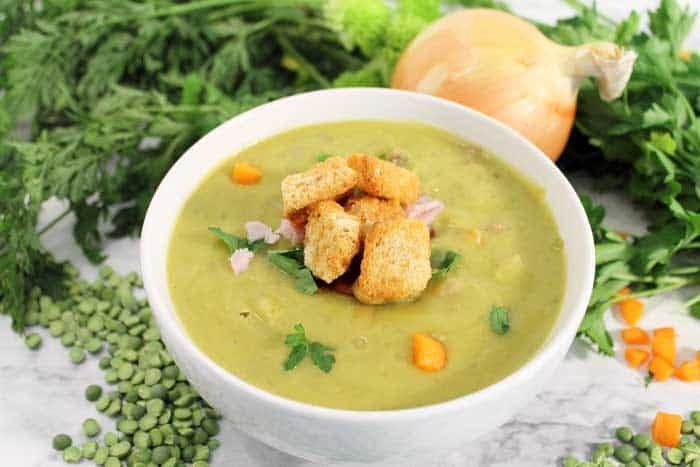 The recipe for this particular split pea soup was actually my Dad’s recipe, adapted slightly by my sister, which I then modified for the Instant Pot. What a time saver it was too! 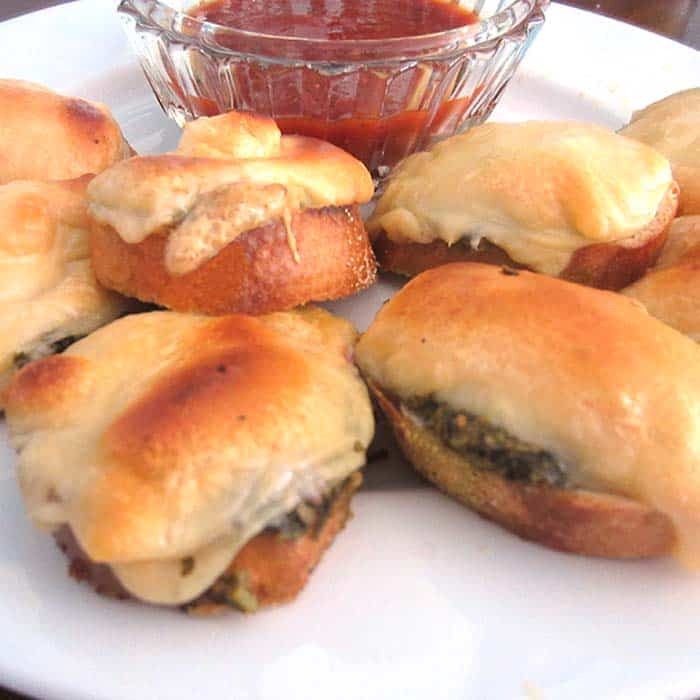 The standard recipe takes 4 hours while this amazing recipe takes just 30 minutes. That’s shaving off a whopping 3-1/2 hours from the total time to make it. Yep, delicious homemade soup in half an hour! Holy cow! 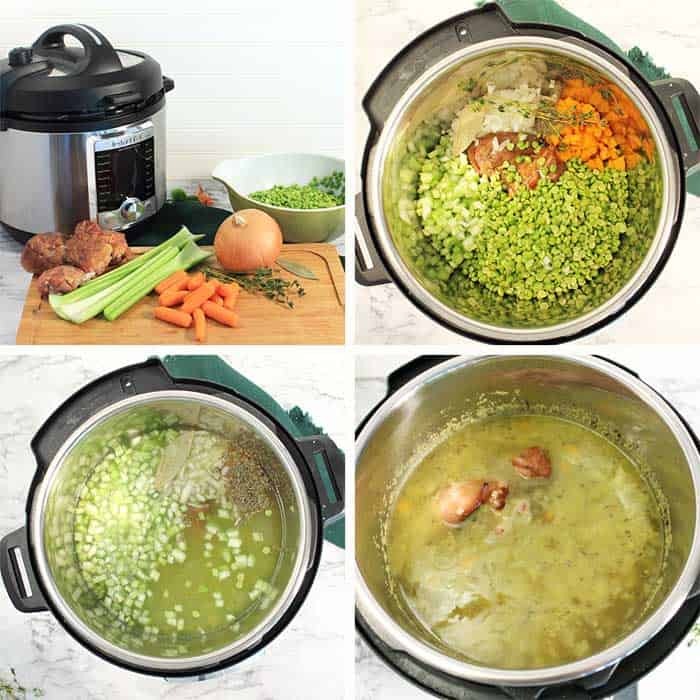 I think soup has got to be one of the easiest recipes to make in an Instant Pot. It’s basically just put the ingredients in the pot, set the pressure and go. Can’t get easier than that! Check it out! 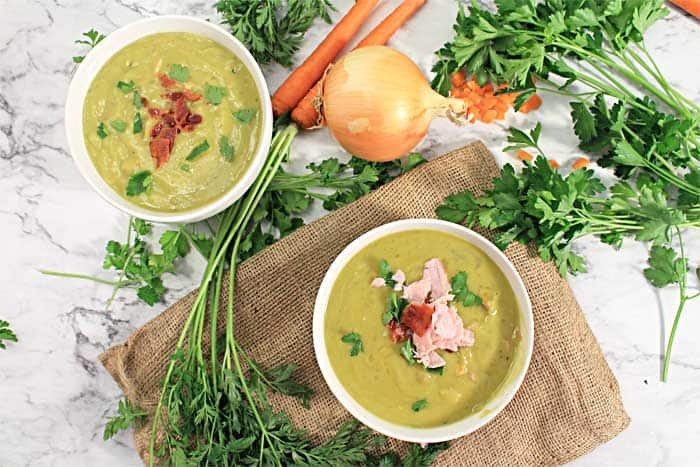 Gather all the ingredients – ham hock, split peas, onion, celery, carrots, bay leaf and thyme. 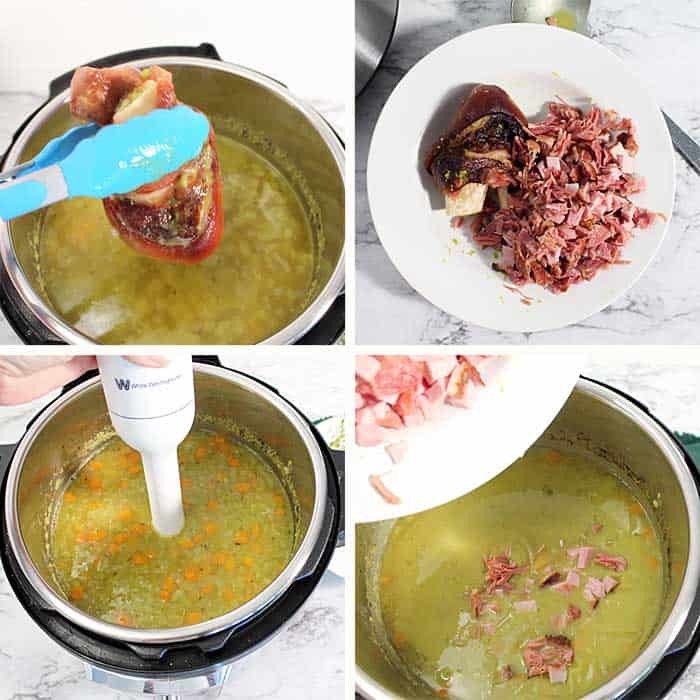 Place all ingredients except chopped ham into Instant Pot. Pour in 7 cups of water. Seal and cook on high pressure for 15 minutes. Let pressure release naturally for 15 minutes then manually release remaining pressure. Remove cover. Remove ham hock and bay leaf. Pull ham off ham hock and shred. Using an immersion blender, a blender can be used but it needs to be done in batches, or a potato masher, blend soup into a puree. Add ham from ham hock and additional ham if desired. Dinner on the table in 30 minutes! And that first bite will have you begging for more! Amazing, a deliciously healthy dinner on the table in just half an hour. I can’t think of anything better to stave off the winter cold than a nice hot, rich soup. 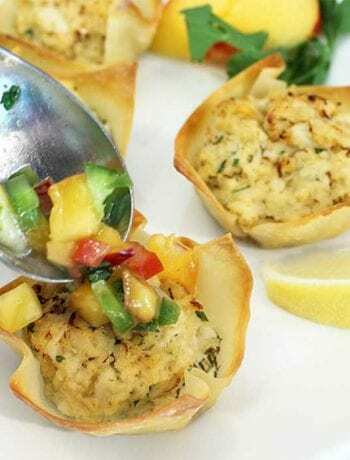 Garnish it with extra ham, bacon, croutons and serve with a side of crackers or a warm fresh loaf of bread. Add all ingredients to Instant Pot except for chopped ham. Pour in 7 cups of water. 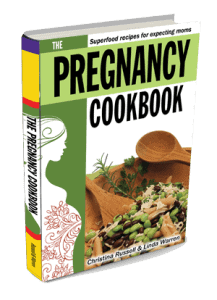 Close and lock lid and set pressure cooker to high. Cook for 15 minutes. Allow pressure to release naturally for 15 minutes then release manually. Remove ham bone and set aside to cool slightly. Remove bay leaf and discard. Puree soup with immersion blender. If you don’t have one, you can use your blender but it must be done in small batches to avoid the build up of heat inside where it might explode. Remove meat from ham bone and shred. Add to soup. I also add another cup of chopped ham from leftovers to beef up the soup a little. Taste test then add salt and pepper, to taste. 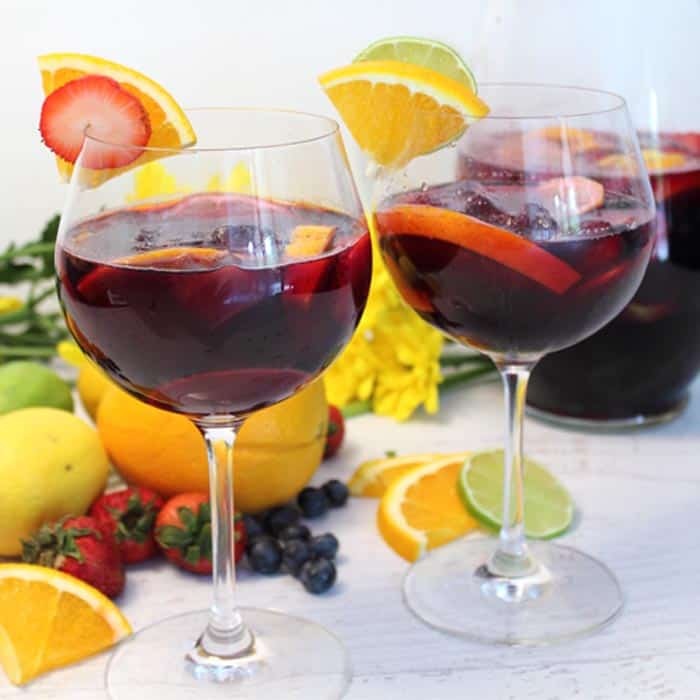 Easy Sangria – Only 3 Ingredients! What a beautiful soup! 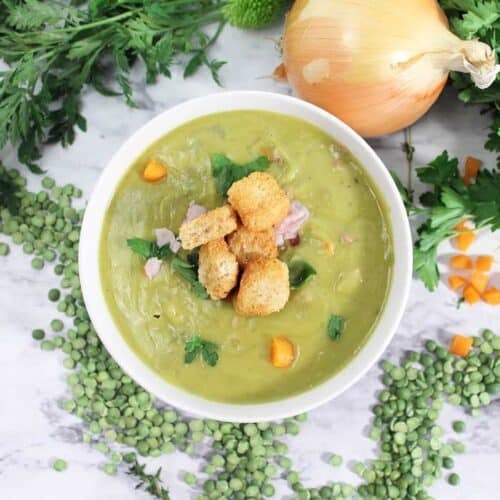 It even turned my husband into a split pea soup lover! Same here! Isn’t it yummy!